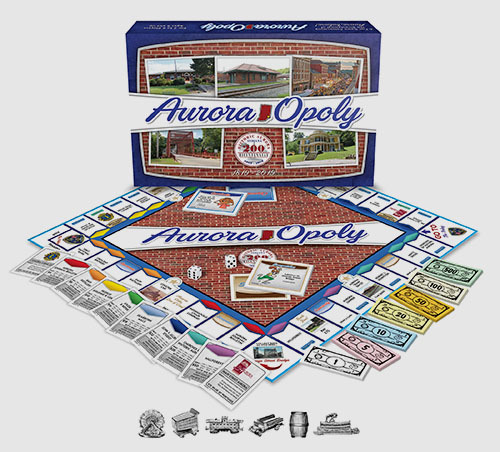 This game is a fun take on the classic Monopoly board game and was created to celebrate Aurora's Bicentennial. Images and locations featured on the board, and even player tokens, are taken from the many sites and icons that can be found in the City of Aurora. Aurora, Indiana is celebrating 200 years since it's founding. 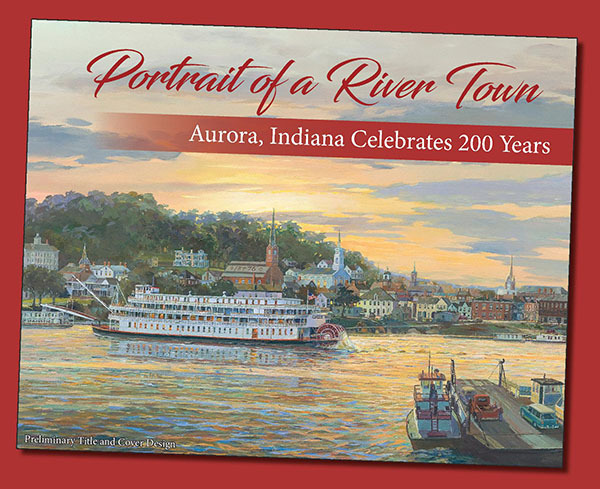 Explore that history and what makes Aurora so special in this hard cover book, "Portraits of a River Town - Aurora, Indiana Celebrates 200 Years." 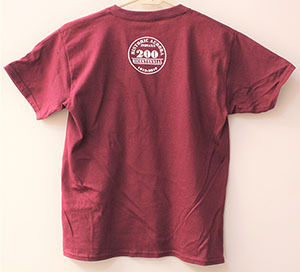 Show your love for Aurora with this special Bicentennial short sleeve shirt. 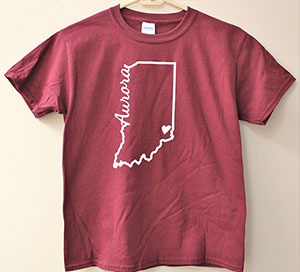 This shirt is red and features on outline of Indiana with a heart at the location of Aurora, Indiana. on the front. On the back the official bicentennial logo is displayed. 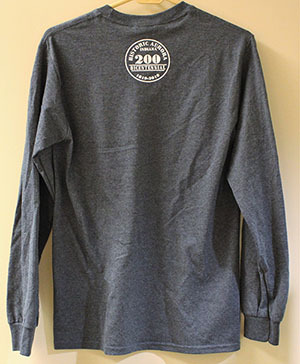 Show your love for Aurora with this special Bicentennial long sleeve shirt. 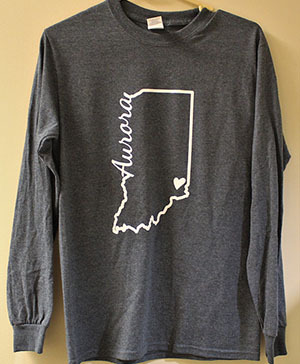 This shirt is gray and features on outline of Indiana with a heart at the location of Aurora, Indiana. on the front. 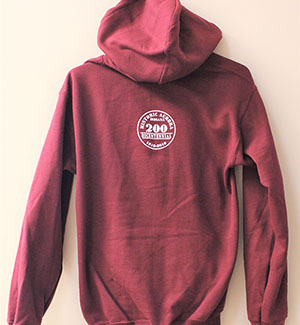 On the back the official bicentennial logo is displayed. A. 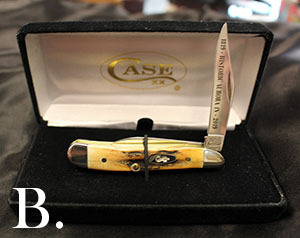 $85.00 This genuine Case® pocket knife has a polished wood grip and features the Aurora Bicentennial logo. "1819 - Celebrating 200 Years - 2019" is etched into the blade. 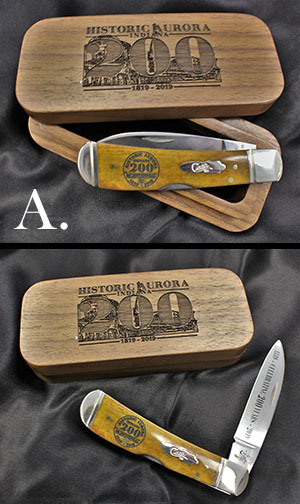 This knife comes with a handsome wood case that also features the larger Aurora Bicentennial logo with iconic images background. B. $65.00 This version of the Bicentennial pocket knife has a grip made from peanut and has "1819 - Historic Aurora IN - 2019" etched into the blade. The knife comes with a felt case. C. $140.00 For the knife collectors out there, pick up both version of the Bicenntial pocket knife and receive a $10.00 discount on the total cost. John Darlin, husband of Aurora native Valerie Nocks Darlin, has created this stunning "Bend in the River" bracelet. 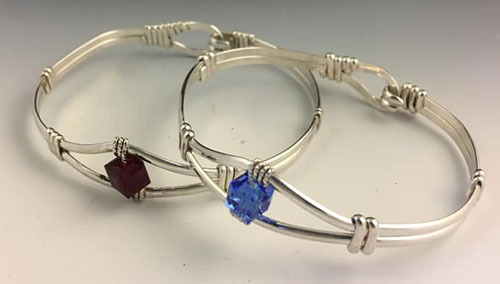 The bracelet is sterling silver with a gentle "bend" at the center and enhanced by a blue Aurora Borealis crystal, signifying Aurora's location at the "bend" in the Ohio River. If you are an alumnus of Aurora High School or would simply like the red crystal better, you can choose to order the Red Devil Edition. 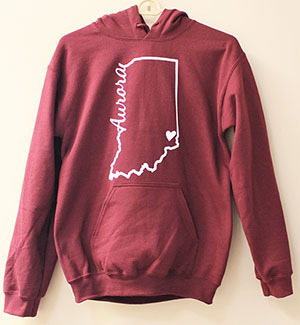 Ten dollars of every purchase goes to Main Street Aurora for the work they do in promoting Aurora and its attributes. This commemorative piece will only be available through December 31, 2019. Each bracelet is packaged with a special commemorative card and gift boxed. Join us in celebrating an historic moment as we celebrate Aurora, IN......just around the bend. 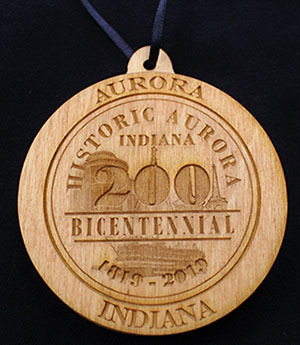 Celebrate Aurora, Indiana's bicentennial with this custom designed wooden ornament. 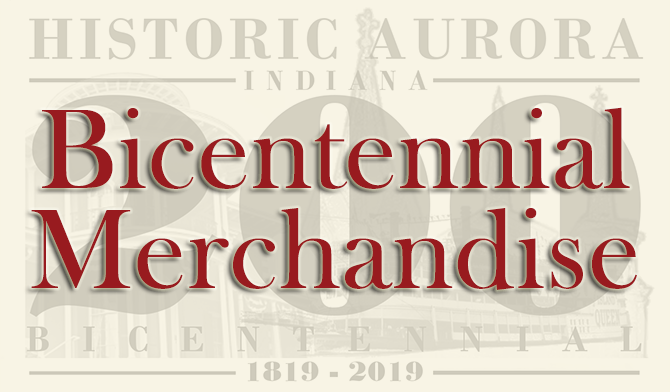 The front face (left) features the City of Aurora logo with the commeration dates, while the back face (right) features the bicentennial logo along with a number of iconic images of the City such as Hillforest Mansion, the Riverboat, and the various church steeples that make Aurora's skyline instantly recognizable. 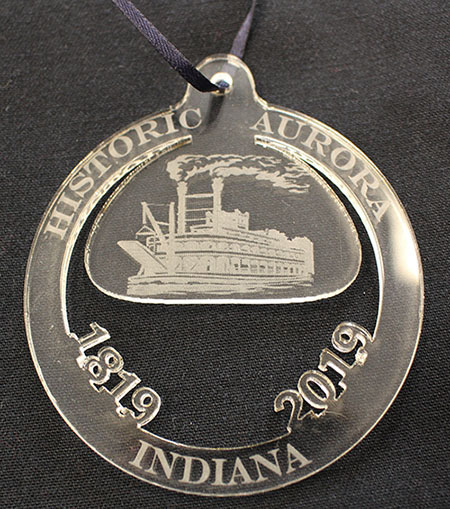 Celebrate Aurora, Indiana's bicentennial with this custom designed acrylic ornament. This ornament features a riverboat, an iconic feature on the Ohio River is years past. The bicentennial years are displayed at the bottom, and "Historic Aurora Indiana is written along the outer circle." 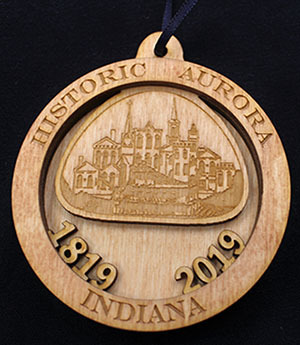 Celebrate Aurora, Indiana's bicentennial with this custom designed acrylic ornament. 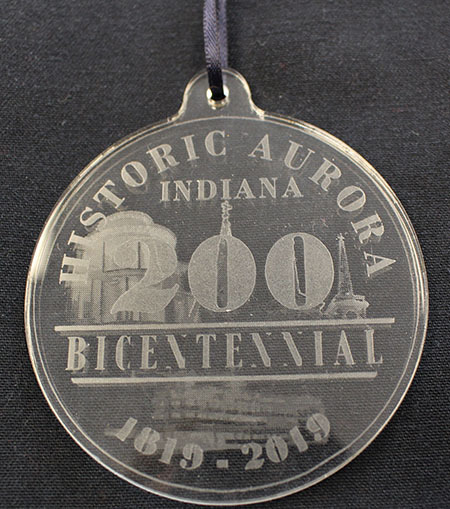 This ornament features the official Aurora Bicentennial logo, with various icons of Aurora's history etched in the background." 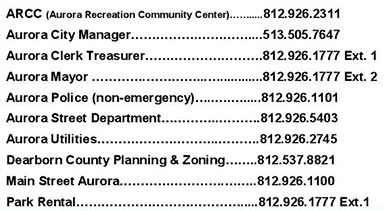 Keep your grocery or to-do list in place with the Aurora Bicentennial magnet. 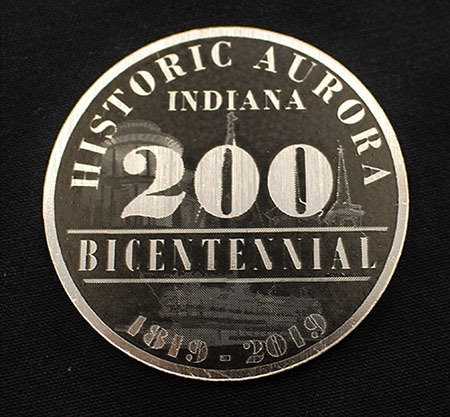 This all metal magnet features the official Aurora Bicentennial logo engraved on it's face." Knock back a round with this commemorative shot glass. 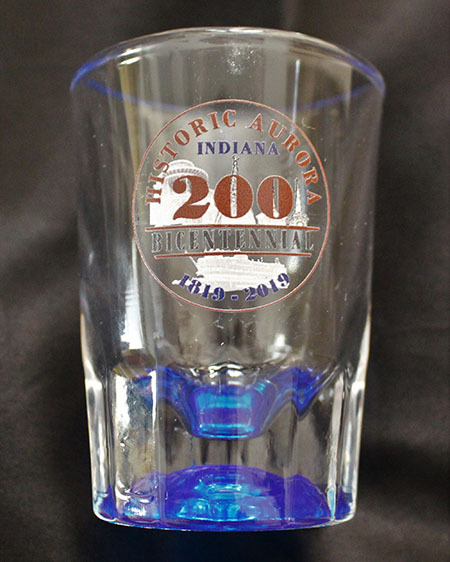 This transparent glass shot features a color version of the official Aurora Bicentennial logo."